Those of us who are blessed with living in the Lone Star State may take for granted the steaming hot, flavorful corn tortillas that many Mexican restaurants still provide free to patrons. Cities and towns of any size at all frequently have a tortilleria, that is, a tortilla factory, where freshly-made tortillas or fresh masa (tortilla dough) can be purchased. Or maybe not. In any case, a resourceful cook, particularly one who relishes Tex-Mex fare, will want to be able to produce a batch of corn tortillas. There is nothing quite like the aroma of hot, handmade tortillas. Your own tortillas will not only rival the restaurant variety, they will taste even better because they are so fresh. According to the Tortilla Industry Association, "tortillas are more popular today in the U.S. than all other ethnic breads, such as bagels, English muffins and pita bread." The average (say 6- to 7-inch) corn tortilla contains about 60 calories, a gram or so each of protein and fat, 12 grams of carbohydrate and 44 milligrams of calcium. Since they are made exclusively of corn flour and contain no wheat gluten, they are an ideal bread alternative for those who are gluten intolerant. But most of all, they are good. Corn tortillas are the foundation of classic Tex-Mex dishes like enchiladas, gorditas, quesadillas, tacos, tostados, and let's not forget corn tortilla chips. Mexican cooks have been patting them out for millennia; tortillas are the bread of Mexico. This article will concern itself with corn tortillas, rather than the wheat flour tortillas that originated in northern Mexico. The ingredients for tortilla making are incredibly, and somewhat deceptively, simple. There are only two: corn flour and water. We could get so basic as to detail the process of making corn flour with parched corn and slaked lime, and grinding the resulting product ourselves, but no one would do that. And besides, there is a product made by The Quaker Oats Company called Masa Harina that makes an excellent corn tortilla. Masa Harina may be difficult to find in some, principally northern, areas of the U.S., and you may have to ask your grocer to order it for you. It can also be obtained by mail order, although it is a bit pricey ($3.95 for 2 pounds, plus shipping), compared to what you pay for it in a local supermarket. Whatever you do, don't confuse corn flour with corn meal. Corn meal is made from a completely different process, and it simply won't work for tortilla making. You'll need a big cast iron skillet or griddle and a tortilla press, too. Tortilla presses have become pretty easy to find in kitchen-supply stores. Not exactly a high-tech gadget, if you pay more than $20 for one, you've paid way too much. If you can't find a tortilla press, it is possible (but not preferable) to press out your tortillas on a flat surface using a heavy, flat-bottomed dish. You'll also need some plastic bags of the sandwich or freezer variety, but more about that later. In most every recipe for corn tortillas, the proportion of ingredients called for is 2 cups of Masa Harina to 1-1/4 to 1-1/3 cups of water. However, the difference between 1/4 cup and 1/3 cup, while only 4 teaspoons, can be critical. Sounds simple enough, but there are several crucial considerations along the way and, until you have made a batch or two and get the hang of it, a few tortilla-making tips will ease the way. When mixing the masa, mix all the Masa Harina with 1-1/4 cup of the water. You can work it with your hands, if you like. If it seems too dry, add additional water, a teaspoon at a time. Too much water, and you won't be able to peel the plastic off the tortilla; too little and your tortilla will be dry and crumbly. Unlike pastry dough, masa does not suffer from being over-handled. The masa will dry out quickly. Keep it covered with a piece of plastic wrap while making your tortillas. Cut up sandwich or (my favorite) freezer bags work better than the flimsier plastic wrap or waxed paper. Hold the pressed tortilla (with the plastic on both sides) in one hand. Peel away the top plastic from the tortilla (not the tortilla from the plastic). Flip it over into your other hand, and peel away the other piece of plastic. Gently place the tortilla on the hot skillet or griddle. It should make a soft sizzling sound when you do. If your tortillas are not perfect circles, don't worry; they will still taste wonderful. If your skillet or griddle is at the right temperature, a tortilla can be cooked in no more than 2 minutes. The use of cast-iron utensils is important. You are cooking at high heat on a dry surface, and a lighter-weight utensil could warp. Brown spots on your tortillas are good -- an indication that they are handmade, rather than punched out of a big machine and cooked assembly-line fashion. The number of tortillas you make with this basic recipe depends upon their size and thickness. I usually get about 12 to 14 tortillas approximately 6 inches in size, depending upon the number I am compelled to eat while I'm cooking (I usually keep the butter and salsa handy during the process). The experienced tortilla cook need not turn out tortillas one at a time. You can get your own assembly-line process going by using two big skillets. Another pair of hands in the form of a kitchen helper can hasten the process, as well. Put your hot tortillas in an aluminum foil pouch wrapped in a kitchen towel or napkin. You want them to stay hot and tender. 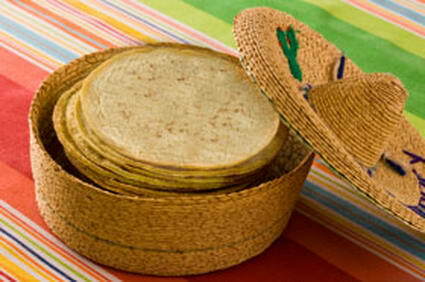 Corn tortillas can be made 2 hours in advance, wrapped and reheated. Bake, in a 350°F oven for about 12 minutes. If you think tortillas from the supermarket taste just fine, this article may not be for you. Come to think of it though, if you think they taste okay, could be you don't really know how a tortilla is supposed to taste. This article could be for you after all. After you have made tortillas once, you will be experienced enough to make the judgment calls regarding the amount of water, cooking temperature and "feel" of the masa. You will know how everything is supposed to look and feel. Best of all, you will know the smell and taste of fresh, handmade corn tortillas produced right in your own kitchen.